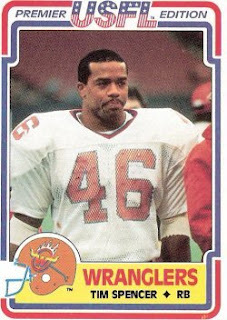 The Arizona Wranglers came into the United States Football League game on June 3, 1984 against the Birmingham Stallions as ten-point underdogs. Head Coach George Allen’s team was 6-8 and barely staying alive in the Pacific Division (Due to what was, in essence, a trade of franchises, the Wranglers were for the most part the same veteran-laden club that played as the Chicago Blitz under Allen in 1983). Meanwhile the Stallions, under Head Coach Rollie Dotsch, were leading the Southern Division with a 12-2 record and had won their last three games in impressive fashion. Furthermore, star RB Joe Cribbs would be back in uniform for Birmingham following a two-week walkout over a contract dispute. There were 32,500 fans at Birmingham’s Legion Field and they saw the home team score first. An interception by CB Ricky Ray that was returned 24 yards – and had an additional 15 tacked on at the end thanks to a facemask penalty – gave the Stallions the ball on the Arizona 15 yard line and set up an eight-yard touchdown pass from QB Cliff Stoudt to WR Ken Toler late in the first quarter. However, Arizona no sooner got the ball back when RB Tim Spencer took off on an 81-yard scoring run that, with the successful extra point, tied the score at 7-7. The Wranglers scored twice in the second quarter, first on a 32-yard field goal by Frank Corral and then, in the final minute before the half, on a 25-yard touchdown pass play from 16-year QB Greg Landry to WR Larry Douglas. Arizona went into halftime with a surprising 17-7 lead. However, the Stallions mounted a comeback in the third quarter. First, RB Leon Perry dove into the end zone from three yards out for a touchdown and then Birmingham took the lead when Stoudt threw to WR Jim Smith for a 21-yard TD. It was 21-17 heading into the final period. Early in the fourth quarter, the Wranglers went back in front thanks to a 17-yard scoring pass from Landry to WR Lenny Willis. They got a further, and ultimately decisive, break when Stoudt fumbled and DT Joe Ehrmann recovered at the Birmingham 15. Landry hit WR Trumaine Johnson for a touchdown from 12 yards out and, with the extra point, Arizona once again held a ten-point lead. Birmingham kept it close when Stoudt threw to WR Joey Jones for a 10-yard TD in the last two minutes, but an onside kick attempt was recovered by the Wranglers who proceeded to deliver the final blow as Spencer ran for a 43-yard touchdown. Arizona came away with a big 38-28 win. The Wranglers outgained Birmingham, 416 to 361, with 246 of those yards coming on the ground (as opposed to 196 yards rushing for the Stallions). Birmingham led in first downs, 25 to 17. However, Arizona sacked Cliff Stoudt seven times, with three accounted for by DT Mark Buben and two by DT Kit Lathrop. Both teams suffered many penalties, as the Wranglers were flagged 15 times at a cost of 105 yards and the Stallions were penalized on 9 occasions for 79 yards. Tim Spencer ran for 177 yards on just 12 carries thanks to the two long scoring runs and FB Kevin Long added another 12 rushes for 62 yards. Greg Landry completed 12 of 21 passes for 185 yards with three touchdowns and one interception. Trumaine Johnson led the team’s receivers with 4 catches for 71 yards and a TD. In his return to the lineup, Joe Cribbs had 110 yards on 16 rushing attempts. Cliff Stoudt was successful on 21 of 27 passes for 225 yards and three scoring passes of his own along with one interception, and also rushed for 43 yards on five carries – however, he also suffered the seven sacks. Lost in the defeat was a big day by Jim Smith, who caught 9 passes for 120 yards and a touchdown. “It’s not the end of the world, but it’s always depressing when you lose,” summed up Coach Dotsch of the Stallions. Arizona didn’t lose again the rest of the regular season, winning the next three contests to finish at 10-8 and qualifying for the playoffs as a Wild Card. The Wranglers kept up the momentum by upsetting Houston in the first round and beat the Lost Angeles Express in the Conference Championship to advance to the league title game, where they fell to the Philadelphia Stars. Birmingham closed out the regular season atop the Southern Division with a 14-4 record, handily beating Tampa Bay in the first round but losing to the Stars in the Eastern Conference Championship game. Despite leaving the team for two games, Joe Cribbs ended up leading the USFL in rushing with 1467 yards. Tim Spencer was fifth with 1212 yards on 227 carries for a 5.3-yard average and 17 rushing touchdowns.